Surf News Network, 15 December, 2014. It’s been a huge week across the globe. Hawaii’s North Shore pumped for the opening round of the Billabong Pipe Masters and the Big Wave World Tour (BWWT) officially kicked off its Northern Hemi season with the Punta Galea Challenge. 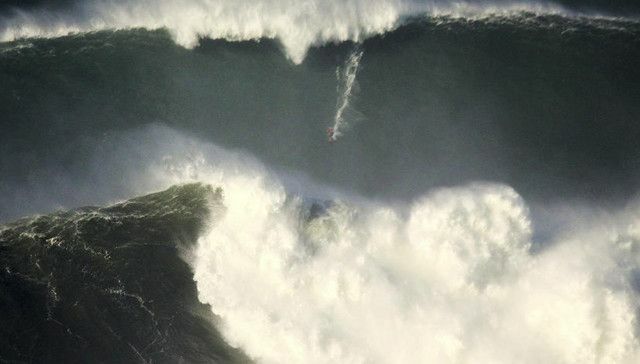 Elsewhere, big wave chargers paddled out for some epic XXL sessions. Here’s a rundown of the December 10 session at Pe’Ahi, Maui and the December 11 session in Nazaré, Portugal from two of the chargers who saw it all go down. “I was in Portugal for past two months and had done some traveling before the big swell came so as soon as we heard about it I just headed up and got everything ready. There was a safety meeting with everyone and then I just took it easy. “I went to bed early and woke up early. I checked cliff at first light. It wasn’t gigantic yet, but it picked up really quick and we knew low tide was at noon so we went out at 10 a.m.
“It looked really clean, one of the cleanest days that I’ve seen. It’s a beachbreak so energy moves around all the time. The first wave I caught was really bumpy and I just tried to get down the face as fast as I could. The third wave was the biggest I caught that day. It was a big, long left. I was surfing for 6 hours straight. I just tried to make the most of it. “We had two big sessions before this. Two weeks ago was pretty big. But the amount of water and how tall they were was crazy. The special thing about this swell was it wasn’t a full storm. It was the side part of the storm that was hitting Ireland and we had good weather so it was weird combination of swell and weather. And we didn’t really expect it it popped up really fast. It was giant. I don’t think I ever went this fast on a surfboard. “I saw the swell coming together on Surfline. It was obvious that it was going to be big so I was pretty nervous. I knew everyone was going to see it and the lineup would be really crowded. I had just lost in the Pipe Invitational so it actually worked out. I just jumped on a plane the next day and headed to Maui. “The night before I ate a lot. I knew it was going to be long, hot, sunny day, and that takes a lot out of you. So we packed all our extra boards and safety gear and a bunch of snacks on the skis and headed out. “It looked perfect. The sun had just come up. The early morning conditions were really pristine, which is pretty rare. Maui is usually windier than that so it was just glassy and perfect. “There were maybe 15 guys in the lineup when I got there and I got a wave off the bat. But when it’s big and glassy like that it’s really crowded. I surfed 7 hours and caught three waves so that kind of gives you an idea. “My first wave was definitely my best. My second wave was really big and I had a bad wipeout so that was pretty memorable as well. My position when the wave came, I was just a tiny bit too deep to make it and I ended up in a really violent wipeout. “A lot of the regular guys were surfing really well — Billy Kemper (HAW), Mark Healey (HAW), Ian Walsh (HAW) — everyone was charging really hard. Keala Kennelly (HAW) and Paige Alms (HAW) were the two girls out there and I was really impressed with their surfing.